This week, Access All Areas members have a new set of brushes to download for Adobe Illustrator, courtesy of Jeremy Child from The Artifex Forge. These brushes allow you to create graffiti inspired art, without the risk of a criminal record! They have been carefully vectorized from real spray can art to allow you to produce realistically sprayed lines with Illustrator’s brush and pen tools. 27 spray paint stroke brushes are included along with 6 bonus splatter brushes that can be used to add extra detail and texturing. The Artifex Forge AKA Jeremy Child supplies original illustrative design resources for Illustrator and Photoshop. In Latin, Artifex means ‘an artist, builder or maker of things’ or ‘ingenious and artistic’, which together with the idea of a forge as a workshop really sums up what he does – the creation of practical, useful and beautiful design and illustration tools (and ‘art effects’)! Check out his store or download a set of his brushes for free here. This set of spray paint brushes includes a total of 33 super realistic graffiti marks, compatible with Adobe Illustrator versions CS1 to CC. 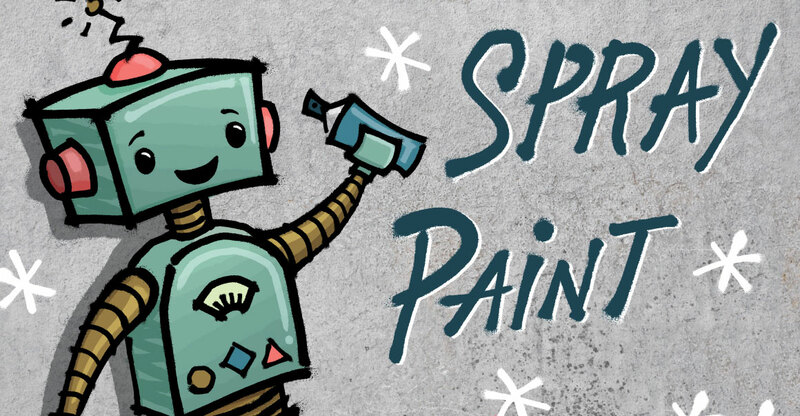 As all the brushes are taken from genuine, on-the-street, painted material they capture the way that spray paint splatters and pools in a way that no completely digital process can realistically recreate. Tablet users will be pleased to know these brushes also work with pressure sensitivity, which works with Illustrator versions CS5+. These look pretty cool! I thank you and Artifex Forge! I agree, it’s a very cool effect! Thanks Su! Wow! Nice tool mate, I have downloaded it and tried myself, I must say this is one of the coolest vector graphic effect I have ever seen, thanks to Adobe premier. I’m really impressed with this tool and keep us updated with many such a tools and thanks for this post, I’m really satisfied with the effects and this is really worth trying. Keep writing great stuffs and don’t stop doing new experiments with these graphic tools. Cool, I’m glad you like it too! I will do my best to find some new and exciting tools! Glad you like Jeremy Child’s work!